In February, three British teenagers fled their London homes to join ISIS in Syria. Though Scotland Yard launched a massive search for the girls, Shamima Begum, 15, Kadiza Sultana, 16, and Amira Abase, 15, were last seen on airport security footage headed for Turkey. According to a new report from the Guardian, two of the teenagers were allowed to contact their families—one via phone and one via social media—and tell them about their recent marriages to ISIS fighters. The Guardian did not identify which of the two girls had contacted their families. The two schoolgirls are understood to have been given an effective “catalogue” of men deemed suitable by Isis for marriage. They then made their picks from those presented to them. The teenagers who married are believed to have been wed to older men, in their 20s. In addition to the confirmation of the girls’ status, there have been conflicting reports as to whether or not they have been actively involved in acts of terrorism. 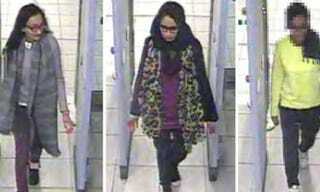 A Daily Telegraph video claimed to show the three girls in Syria carrying guns. The women in the video could not, however, be clearly identified since they are wearing burqas. Their families deny that the women in the video are their daughters.